The European-American naming of the Alabama River and state was derived from the Alabama people, a Muskogean-speaking tribe whose members lived just below the confluence of the Coosa and Tallapoosa rivers on the upper reaches of the river. In the Alabama language, the word for a person of Alabama lineage is Albaamo (or variously Albaama or Albàamo in different dialects; the plural form is Albaamaha). The suggestion that “Alabama” was borrowed from the Choctaw language is unlikely. The word’s spelling varies significantly among historical sources. The first usage appears in three accounts of the Hernando de Soto expedition of 1540: Garcilaso de la Vega used Alibamo, while the Knight of Elvas and Rodrigo Ranjel wrote Alibamu and Limamu, respectively, in transliterations of the term. As early as 1702, the French called the tribe the Alibamon, with French maps identifying the river as Rivière des Alibamons. Other spellings of the name have included Alibamu, Alabamo, Albama, Alebamon, Alibama, Alibamou, Alabamu, Allibamou. Sources disagree on the word’s meaning. Some scholars suggest the word comes from the Choctaw alba (meaning “plants” or “weeds”) and amo (meaning “to cut”, “to trim”, or “to gather”). The meaning may have been “clearers of the thicket” or “herb gatherers”, referring to clearing land for cultivation or collecting medicinal plants. The state has numerous place names of Native American origin. However, there are no correspondingly similar words in the Alabama language. An 1842 article in the Jacksonville Republican proposed it meant “Here We Rest.” This notion was popularized in the 1850s through the writings of Alexander Beaufort Meek. Experts in the Muskogean languages have not found any evidence to support such a translation. The agrarian Mississippian culture covered most of the state from 1000 to 1600 AD, with one of its major centers built at what is now the Moundville Archaeological Site in Moundville, Alabama. This is the second-largest complex of the classic Middle Mississippian era, after Cahokia in present-day Illinois, which was the center of the culture. Analysis of artifacts from archaeological excavations at Moundville were the basis of scholars’ formulating the characteristics of the Southeastern Ceremonial Complex (SECC). Contrary to popular belief, the SECC appears to have no direct links to Mesoamerican culture, but developed independently. The Ceremonial Complex represents a major component of the religion of the Mississippian peoples; it is one of the primary means by which their religion is understood. With exploration in the 16th century, the Spanish were the first Europeans to reach Alabama. The expedition of Hernando de Soto passed through Mabila and other parts of the state in 1540. More than 160 years later, the French founded the region’s first European settlement at Old Mobile in 1702. The city was moved to the current site of Mobile in 1711. This area was claimed by the French from 1702 to 1763 as part of La Louisiane. After the French lost to the British in the Seven Years’ War, it became part of British West Florida from 1763 to 1783. After the United States victory in the American Revolutionary War, the territory was divided between the United States and Spain. The latter retained control of this western territory from 1783 until the surrender of the Spanish garrison at Mobile to U.S. forces on April 13, 1813. Thomas Bassett, a loyalist to the British monarchy during the Revolutionary era, was one of the earliest white settlers in the state outside Mobile. He settled in the Tombigbee District during the early 1770s. The district’s boundaries were roughly limited to the area within a few miles of the Tombigbee River and included portions of what is today southern Clarke County, northernmost Mobile County, and most of Washington County. Before Mississippi’s admission to statehood on December 10, 1817, the more sparsely settled eastern half of the territory was separated and named the Alabama Territory. The United States Congress created the Alabama Territory on March 3, 1817. St. Stephens, now abandoned, served as the territorial capital from 1817 to 1819. Southeastern planters and traders from the Upper South brought slaves with them as the cotton plantations in Alabama expanded. The economy of the central Black Belt (named for its dark, productive soil) was built around large cotton plantations whose owners’ wealth grew mainly from slave labor. The area also drew many poor, disfranchised people who became subsistence farmers. 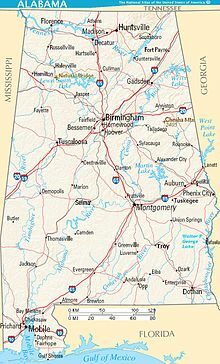 Alabama had an estimated population of under 10,000 people in 1810, but it increased to more than 300,000 people by 1830. Most Native American tribes were completely removed from the state within a few years of the passage of the Indian Removal Act by Congress in 1830. From 1826 to 1846, Tuscaloosa served as Alabama’s capital. On January 30, 1846, the Alabama legislature announced it had voted to move the capital city from Tuscaloosa to Montgomery. The first legislative session in the new capital met in December 1847. A new capitol building was erected under the direction of Stephen Decatur Button of Philadelphia. The first structure burned down in 1849, but was rebuilt on the same site in 1851. This second capitol building in Montgomery remains to the present day. It was designed by Barachias Holt of Exeter, Maine. By 1860, the population had increased to 964,201 people, of which nearly half, 435,080, were enslaved African Americans, and 2,690 were free people of color. On January 11, 1861, Alabama declared its secession from the Union. After remaining an independent republic for a few days, it joined the Confederate States of America. The Confederacy’s capital was initially at Montgomery. Alabama was heavily involved in the American Civil War. Although comparatively few battles were fought in the state, Alabama contributed about 120,000 soldiers to the war effort. A company of cavalry soldiers from Huntsville, Alabama, joined Nathan Bedford Forrest‘s battalion in Hopkinsville, Kentucky. The company wore new uniforms with yellow trim on the sleeves, collar and coat tails. This led to them being greeted with “Yellowhammer”, and the name later was applied to all Alabama troops in the Confederate Army. Alabama’s slaves were freed by the 13th Amendment in 1865. Alabama was under military rule from the end of the war in May 1865 until its official restoration to the Union in 1868. From 1867 to 1874, with most white citizens barred temporarily from voting and freedmen enfranchised, many African Americans emerged as political leaders in the state. Alabama was represented in Congress during this period by three African-American congressmen: Jeremiah Haralson, Benjamin S. Turner, and James T. Rapier. Following the war, the state remained chiefly agricultural, with an economy tied to cotton. During Reconstruction, state legislators ratified a new state constitution in 1868 that created the state’s first public school system and expanded women’s rights. Legislators funded numerous public road and railroad projects, although these were plagued with allegations of fraud and misappropriation. Organized insurgent, resistance groups tried to suppress the freedmen and Republicans. Besides the short-lived original Ku Klux Klan, these included the Pale Faces, Knights of the White Camellia, Red Shirts, and the White League. Reconstruction in Alabama ended in 1874, when the Democrats regained control of the legislature and governor’s office through an election dominated by fraud and violence. They wrote another constitution in 1875, and the legislature passed the Blaine Amendment, prohibiting public money from being used to finance religious-affiliated schools. The same year, legislation was approved that called for racially segregated schools. Railroad passenger cars were segregated in 1891. After disfranchising most African Americans and many poor whites in the 1901 constitution, the Alabama legislature passed more Jim Crow laws at the beginning of the 20th century to impose segregation in everyday life. 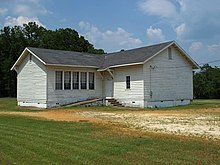 Beginning in 1913, the first 80 Rosenwald Schools were built in Alabama for African-American children. A total of 387 schools, seven teachers’ houses, and several vocational buildings were completed by 1937 in the state. Several of the surviving school buildings in the state are now listed on the National Register of Historic Places. Continued racial discrimination and lynchings, agricultural depression, and the failure of the cotton crops due to boll weevil infestation led tens of thousands of African Americans from rural Alabama and other states to seek opportunities in northern and midwestern cities during the early decades of the 20th century as part of the Great Migration out of the South. Reflecting this emigration, the population growth rate in Alabama (see “historical populations” table below) dropped by nearly half from 1910 to 1920. At the same time, many rural people migrated to the city of Birmingham to work in new industrial jobs. Birmingham experienced such rapid growth that it was called the “Magic City”. 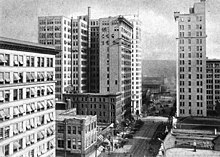 By 1920, Birmingham was the 36th-largest city in the United States. Heavy industry and mining were the basis of its economy. Its residents were under-represented for decades in the state legislature, which refused to redistrict after each decennial census according to population changes, as it was required by the state constitution. This did not change until the late 1960s following a lawsuit and court order. Beginning in the 1940s, when the courts started taking the first steps to recognize the voting rights of black voters, the Alabama legislature took several counter-steps designed to disfranchise black voters. The legislature passed, and the voters ratified [as these were mostly white voters], a state constitutional amendment that gave local registrars greater latitude to disqualify voter registration applicants. Black citizens in Mobile successfully challenged this amendment as a violation of the Fifteenth Amendment. The legislature also changed the boundaries of Tuskegee to a 28-sided figure designed to fence out blacks from the city limits. The Supreme Court unanimously held that this racial “gerrymandering” violated the Constitution. In 1961, … the Alabama legislature also intentionally diluted the effect of the black vote by instituting numbered place requirements for local elections. In the United States Supreme Court cases of Baker v. Carr (1962) and Reynolds v. Sims (1964), the court ruled ruled that the principle of “one man, one vote” needed to be the basis of both houses of state legislatures as well, and that their districts had to be based on population, rather than geographic counties, as Alabama had used for its senate. Alabama has made some changes since the late 20th century and has used new types of voting to increase representation. In the 1980s, an omnibus redistricting case, , challenged the at-large voting for representative seats of 180 Alabama jurisdictions, including counties and school boards. At-large voting had diluted the votes of any minority in a county, as the majority tended to take all seats. Despite African Americans making up a significant minority in the state, they had been unable to elect any representatives in most of the at-large jurisdictions. The highest point is Mount Cheaha, at a height of 2,413 ft (735 m). Alabama’s land consists of 22 million acres (89,000 km2) of forest or 67% of total land area. Suburban Baldwin County, along the Gulf Coast, is the largest county in the state in both land area and water area. Additionally, Alabama has four National Forests: Conecuh, Talladega, Tuskegee, and William B. Bankhead. Alabama also contains the Natchez Trace Parkway, the Selma To Montgomery National Historic Trail, and the Trail Of Tears National Historic Trail. A notable natural wonder in Alabama is “Natural Bridge” rock, the longest natural bridge east of the Rockies, located just south of Haleyville. A 5-mile (8 km)-wide meteorite impact crater is located in Elmore County, just north of Montgomery. This is the Wetumpka crater, the site of “Alabama’s greatest natural disaster.” A 1,000-foot (300 m)-wide meteorite hit the area about 80 million years ago. The hills just east of downtown Wetumpka showcase the eroded remains of the impact crater that was blasted into the bedrock, with the area labeled the Wetumpka crater or astrobleme (“star-wound”) because of the concentric rings of fractures and zones of shattered rock that can be found beneath the surface. In 2002, Christian Koeberl with the Institute of Geochemistry University of Vienna published evidence and established the site as the 157th recognized impact crater on Earth. 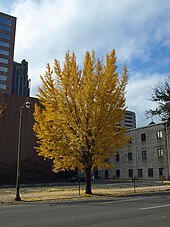 Winters are generally mild in Alabama, as they are throughout most of the Southeastern United States, with average January low temperatures around 40 °F (4 °C) in Mobile and around 32 °F (0 °C) in Birmingham. Although snow is a rare event in much of Alabama, areas of the state north of Montgomery may receive a dusting of snow a few times every winter, with an occasional moderately heavy snowfall every few years. Historic snowfall events include New Year’s Eve 1963 snowstorm and the 1993 Storm of the Century. The annual average snowfall for the Birmingham area is 2 inches (51 mm) per year. In the southern Gulf coast, snowfall is less frequent, sometimes going several years without any snowfall. Alabama’s highest temperature of 112 °F (44 °C) was recorded on September 5, 1925, in the unincorporated community of Centerville. The record low of −27 °F (−33 °C) occurred on January 30, 1966, in New Market. 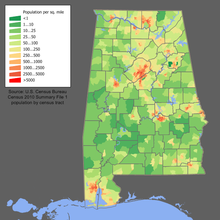 According to the 2010 Census, Alabama had a population of 4,779,736. The racial composition of the state was 68.5% White (67.0% Non-Hispanic White and 1.5% Hispanic White), 26.2% Black or African American, 3.9% Hispanic or Latino of any race, 1.1% Asian, 0.6% American Indian and Alaska Native, 0.1% Native Hawaiian and Other Pacific Islander, 2.0% from Some Other Race, and 1.5% from Two or More Races. In 2011, 46.6% of Alabama’s population younger than age 1 were minorities. The largest reported ancestry groups in Alabama are: African (26.2%), English (23.6%), Irish (7.7%), German (5.7%), and Scots-Irish (2.0%). Those citing “American” ancestry in Alabama are generally of English or British ancestry; many Anglo-Americans identify as having American ancestry because their roots have been in North America for so long, in some cases since the 1600s. Demographers estimate that a minimum of 20–23% of people in Alabama are of predominantly English ancestry and that the figure is likely higher. In the 1980 census, 41% of the people in Alabama identified as being of English ancestry, making them the largest ethnic group at the time. 95.1% of all Alabama residents five years old or older spoke only English at home in 2010, a minor decrease from 96.1% in 2000. Alabama English is predominantly Southern, and is related to South Midland speech which was taken across the border from Tennessee. In the major Southern speech region, there is the decreasing loss of the final /r/, for example the /boyd/ pronunciation of ‘bird’. In the northern third of the state, there is a South Midland ‘arm’ and ‘barb’ rhyming with ‘form’ and ‘orb’. Unique words in Alabama English include: redworm (earthworm), peckerwood (woodpecker), snake doctor and snake feeder (dragonfly), tow sack (burlap bag), plum peach (clingstone), French harp (harmonica), and dog irons (andirons). Temple B’Nai Sholom in Huntsville, established in 1876. It is the oldest synagogue building in continuous use in the state. In a 2007 survey, nearly 70% of respondents could name all four of the Christian Gospels. Of those who indicated a religious preference, 59% said they possessed a “full understanding” of their faith and needed no further learning. In a 2007 poll, 92% of Alabamians reported having at least some confidence in churches in the state. Although in much smaller numbers, many other religious faiths are represented in the state as well, including Judaism, Islam, Hinduism, Buddhism, Sikhism, the Bahá’í Faith, and Unitarian Universalism. Jews have been present in what is now Alabama since 1763, during the colonial era of Mobile, when Sephardic Jews immigrated from London. The oldest Jewish congregation in the state is Congregation Sha’arai Shomayim in Mobile. It was formally recognized by the state legislature on January 25, 1844. Later immigrants in the nineteenth and twentieth centuries tended to be Ashkenazi Jews from eastern Europe. 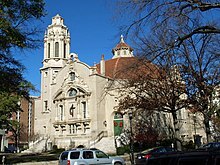 Jewish denominations in the state include two Orthodox, four Conservative, ten Reform, and one Humanistic synagogue. The first community of adherents of the Bahá’í Faith in Alabama was founded in 1896 by Paul K. Dealy, who moved from Chicago to Fairhope. Bahá’í centers in Alabama exist in Birmingham, Huntsville, and Florence. The state has invested in aerospace, education, health care, banking, and various heavy industries, including automobile manufacturing, mineral extraction, steel production and fabrication. By 2006, crop and animal production in Alabama was valued at $1.5 billion. In contrast to the primarily agricultural economy of the previous century, this was only about 1% of the state’s gross domestic product. The number of private farms has declined at a steady rate since the 1960s, as land has been sold to developers, timber companies, and large farming conglomerates. According to the U.S. Bureau of Economic Analysis, the 2008 total gross state product was $170 billion, or $29,411 per capita. Alabama’s 2012 GDP increased 1.2% from the previous year. The single largest increase came in the area of information. In 2010, per capita income for the state was $22,984. The state’s seasonally adjusted unemployment rate was 5.8% in April 2015. This compared to a nationwide seasonally adjusted rate of 5.4%. Alabama has no state minimum wage and uses the federal minimum wage of $7.25. In February 2016, the state passed legislation that prevents Alabama municipalities from raising the minimum wage in their locality. The legislation voids a Birmingham city ordinance that was to raise the city’s minimum wage to $10.10. As of 2018, Alabama has the sixth highest poverty rate among states in the U.S. In 2017, United Nations Special Rapporteur Philip Alston toured parts of rural Alabama and observed environmental conditions that he said were poorer than anywhere he had seen in the developed world. Alabama’s agricultural outputs include poultry and eggs, cattle, fish, plant nursery items, peanuts, cotton, grains such as corn and sorghum, vegetables, milk, soybeans, and peaches. Although known as “The Cotton State“, Alabama ranks between eighth and tenth in national cotton production, according to various reports, with Texas, Georgia and Mississippi comprising the top three. Alabama’s industrial outputs include iron and steel products (including cast-iron and steel pipe); paper, lumber, and wood products; mining (mostly coal); plastic products; cars and trucks; and apparel. In addition, Alabama produces aerospace and electronic products, mostly in the Huntsville area, the location of NASA‘s George C. Marshall Space Flight Center and the U.S. Army Materiel Command, headquartered at Redstone Arsenal. A great deal of Alabama’s economic growth since the 1990s has been due to the state’s expanding automotive manufacturing industry. Located in the state are Honda Manufacturing of Alabama, Hyundai Motor Manufacturing Alabama, Mercedes-Benz U.S. International, and Toyota Motor Manufacturing Alabama, as well as their various suppliers. Since 1993, the automobile industry has generated more than 67,800 new jobs in the state. Alabama currently ranks 4th in the nation for vehicle exports. Automakers accounted for approximately a third of the industrial expansion in the state in 2012. The eight models produced at the state’s auto factories totaled combined sales of 74,335 vehicles for 2012. The strongest model sales during this period were the Hyundai Elantra compact car, the Mercedes-Benz GL-Class sport utility vehicle and the Honda Ridgeline sport utility truck. Steel producers Outokumpu, Nucor, SSAB, ThyssenKrupp, and U.S. Steel have facilities in Alabama and employ over 10,000 people. In May 2007, German steelmaker ThyssenKrupp selected Calvert in Mobile County for a 4.65 billion combined stainless and carbon steel processing facility. ThyssenKrupp’s stainless steel division, Inoxum, including the stainless portion of the Calvert plant, was sold to Finnish stainless steel company Outokumpu in 2012. The remaining portion of the ThyssenKrupp plant had final bids submitted by ArcelorMittal and Nippon Steel for $1.6 billion in March 2013. Companhia Siderúrgica Nacional submitted a combined bid for the mill at Calvert, plus a majority stake in the ThyssenKrupp mill in Brazil, for $3.8 billion. In July 2013, the plant was sold to ArcelorMittal and Nippon Steel. Construction of an Airbus A320 family aircraft assembly plant in Mobile was formally announced by Airbus CEO Fabrice Brégier from the Mobile Convention Center on July 2, 2012. The plans include a $600 million factory at the Brookley Aeroplex for the assembly of the A319, A320 and A321 aircraft. Construction began in 2013, with plans for it to become operable by 2015 and produce up to 50 aircraft per year by 2017. The assembly plant is the company’s first factory to be built within the United States. It was announced on February 1, 2013, that Airbus had hired Alabama-based Hoar Construction to oversee construction of the facility. 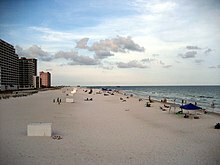 Alabama’s beaches are one of the state’s major tourist destinations. An estimated 20 million tourists visit the state each year. Over 100,000 of these are from other countries, including from Canada, the United Kingdom, Germany and Japan. In 2006, 22.3 million travellers spent $8.3 billion providing an estimated 162,000 jobs in the state. [not in citation given] Some of the most popular areas include the Rocket City of Huntsville, the beaches along the Gulf, and the state’s capitol in Montgomery. 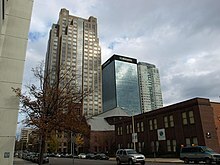 Regions-Harbert Plaza, Regions Center, and Wells Fargo Tower in Birmingham’s financial district. The city still has major operations for Wachovia and its now post-operating bank Wells Fargo, which includes a regional headquarters, an operations center campus and a $400 million data center. Nearly a dozen smaller banks are also headquartered in the Birmingham, such as Superior Bancorp, , and New South Federal Savings Bank. Birmingham also serves as the headquarters for several large investment management companies, including Harbert Management Corporation. The foundational document for Alabama’s government is the Alabama Constitution, which was ratified in 1901. At almost 800 amendments and 310,000 words, it is by some accounts the world’s longest constitution and is roughly forty times the length of the United States Constitution. There has been a significant movement to rewrite and modernize Alabama’s constitution. Critics argue that Alabama’s constitution maintains highly centralized power with the state legislature, leaving practically no power in local hands. Most counties do not have home rule. Any policy changes proposed in different areas of the state must be approved by the entire Alabama legislature and, frequently, by state referendum. One criticism of the current constitution claims that its complexity and length intentionally codify segregation and racism. Alabama’s government is divided into three coequal branches. The legislative branch is the Alabama Legislature, a bicameral assembly composed of the Alabama House of Representatives, with 105 members, and the Alabama Senate, with 35 members. The Legislature is responsible for writing, debating, passing, or defeating state legislation. The Republican Party currently holds a majority in both houses of the Legislature. The Legislature has the power to override a gubernatorial veto by a simple majority (most state Legislatures require a two-thirds majority to override a veto). Until 1964, the state elected state senators on a geographic basis by county, with one per county. It had not redistricted congressional districts since passage of its constitution in 1901; as a result, urbanized areas were grossly underrepresented. It had not changed legislative districts to reflect the decennial censuses, either. In Reynolds v. Sims (1964), the US Supreme Court implemented the principle of “one man, one vote“, ruling that congressional districts had to be reapportioned based on censuses (as the state already included in its constitution but had not implemented.) Further, the court ruled that both houses of bicameral state legislatures had to be apportioned by population, as there was no constitutional basis for states to have geographically based systems. 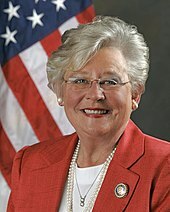 Governor Kay Ivey is the current and second female Governor of Alabama. She is the only Republican female Governor in the state’s history. The judicial branch is responsible for interpreting the state’s Constitution and applying the law in state criminal and civil cases. 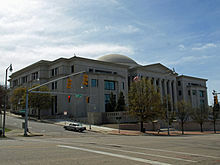 The state’s highest court is the Supreme Court of Alabama. Alabama uses partisan elections to select judges. Since the 1980s judicial campaigns have become increasingly politicized. The current chief justice of the Alabama Supreme Court is Republican Tom Parker. All sitting justices on the Alabama Supreme Court are members of the Republican Party. There are two intermediate appellate courts, the Court of Civil Appeals and the Court of Criminal Appeals, and four trial courts: the circuit court (trial court of general jurisdiction), and the district, probate, and municipal courts. Alabama’s income tax on poor working families is among the highest in the United States. Alabama is the only state that levies income tax on a family of four with income as low as $4,600, which is barely one-quarter of the federal poverty line. Alabama’s threshold is the lowest among the 41 states and the District of Columbia with income taxes. Since Alabama’s tax structure largely depends on consumer spending, it is subject to high variable budget structure. For example, in 2003, Alabama had an annual budget deficit as high as $670 million. The state legislature has retained power over local governments by refusing to pass a constitutional amendment establishing home rule for counties, as recommended by the 1973 Alabama Constitutional Commission. Legislative delegations retain certain powers over each county. United States Supreme Court decisions in Baker v. Carr (1964) required that both houses have districts established on the basis of population, and redistricted after each census, in order to implement the principle of “one man, one vote”. Before that, each county was represented by one state senator, leading to under-representation in the state senate for more urbanized, populous counties. The rural bias of the state legislature, which had also failed to redistrict seats in the state house, affected politics well into the 20th century, failing to recognize the rise of industrial cities and urbanized areas. Alabama is an alcoholic beverage control state, meaning that the state government holds a monopoly on the sale of alcohol. The controls the sale and distribution of alcoholic beverages in the state. Twenty-five of the 67 counties are “dry counties” which ban the sale of alcohol, and there are many dry municipalities even in counties which permit alcohol sales. Alabama state politics gained nationwide and international attention in the 1950s and 1960s during the civil rights movement, when whites bureaucratically, and at times violently, resisted protests for electoral and social reform. Governor George Wallace, the state’s only four-term governor, was a controversial figure who vowed to maintain segregation. Only after passage of the federal Civil Rights Act of 1964 and Voting Rights Act of 1965 did African Americans regain the ability to exercise suffrage, among other civil rights. In many jurisdictions, they continued to be excluded from representation by at-large electoral systems, which allowed the majority of the population to dominate elections. Some changes at the county level have occurred following court challenges to establish single-member districts that enable a more diverse representation among county boards. In 2007, the Alabama Legislature passed, and Republican Governor Bob Riley signed a resolution expressing “profound regret” over slavery and its lingering impact. In a symbolic ceremony, the bill was signed in the Alabama State Capitol, which housed Congress of the Confederate States of America. As of December 2017, there are a total of 3,326,812 registered voters, with 2,979,576 active, and the others inactive in the state. With the disfranchisement of Blacks in 1901, the state became part of the “Solid South“, a system in which the Democratic Party operated as effectively the only viable political party in every Southern state. For nearly 100 years, local and state elections in Alabama were decided in the Democratic Party primary, with generally only token Republican challengers running in the General Election. Since the mid to late 20th century, however, there has been a realignment among the two major political parties, and white conservatives started shifting to the Republican Party. In Alabama, majority-white districts are now expected to regularly elect Republican candidates to federal, state and local office. Alabama’s 67 County Sheriffs are elected in partisan, at-large races, and Democrats still retain the narrow majority of those posts. The current split is 35 Democrats, 31 Republicans, and one Independent Fayette. However, most of the Democratic sheriffs preside over rural and less populated counties. The majority of Republican sheriffs have been elected in the more urban/suburban and heavily populated counties. As of 2015, the state of Alabama has one female sheriff, in Morgan County, Alabama, and ten African-American sheriffs. The state’s two U.S. senators are Republican Richard C. Shelby and Democrat Doug Jones. Shelby was originally elected to the Senate as a Democrat in 1986 and re-elected in 1992, but switched parties immediately following the November 1994 general election. While Alabama’s public education system has improved in recent decades, it lags behind in achievement compared to other states. According to U.S. Census data (2000), Alabama’s high school graduation rate—75%—is the fourth lowest in the U.S. (after Kentucky, Louisiana and Mississippi). The largest educational gains were among people with some college education but without degrees. Alabama’s programs of higher education include 14 four-year public universities, two-year community colleges, and 17 private, undergraduate and graduate universities. In the state are four medical schools (as of fall 2015) (University of Alabama School of Medicine, University of South Alabama and Alabama College of Osteopathic Medicine and The Edward Via College of Osteopathic Medicine – Auburn Campus), two veterinary colleges (Auburn University and Tuskegee University), a dental school (University of Alabama School of Dentistry), an optometry college (University of Alabama at Birmingham), two pharmacy schools (Auburn University and Samford University), and five law schools (University of Alabama School of Law, Birmingham School of Law, Cumberland School of Law, Miles Law School, and the Thomas Goode Jones School of Law). Public, post-secondary education in Alabama is overseen by the Alabama Commission on Higher Education and the . Colleges and universities in Alabama offer degree programs from two-year associate degrees to a multitude of doctoral level programs. The Port of Mobile, Alabama’s only saltwater port, is a large seaport on the Gulf of Mexico with inland waterway access to the Midwest by way of the Tennessee-Tombigbee Waterway. The Port of Mobile was ranked 12th by tons of traffic in the United States during 2009. The newly expanded container terminal at the Port of Mobile was ranked as the 25th busiest for container traffic in the nation during 2011. The state’s other ports are on rivers with access to the Gulf of Mexico. ^ Stephens, Challen (October 19, 2015). “A look at the languages spoken in Alabama and the drop in the Spanish speaking population”. AL.com. Retrieved September 21, 2016. ^ “State of Alabama”. The Battle of Gettysburg. Retrieved July 21, 2014. ^ “Cheehahaw”. NGS data sheet. U.S. National Geodetic Survey. Retrieved October 20, 2011. ^ “Alabama Transportation Overview” (PDF). Economic Development Partnership of Alabama. Retrieved January 21, 2017. ^ “Alabama”. QuickFacts. United States Census Bureau. Archived from the original on September 10, 2012. Retrieved September 22, 2012. ^ Thomason, Michael (2001). Mobile: The New History of Alabama’s First City. Tuscaloosa: University of Alabama Press. pp. 2–21. ISBN 978-0-8173-1065-3. ^ a b “Alabama Occupational Projections 2008-2018” (PDF). Alabama Department of Industrial Relations. State of Alabama. Archived from the original (PDF) on January 17, 2013. Retrieved September 22, 2012. ^ a b c d e f g h “Alabama: The State Name”. All About Alabama. Alabama Department of Archives and History. Archived from the original on June 28, 2007. Retrieved August 2, 2007. ^ and possibly Alabahmu. The use of state names derived from Native American languages is common in the US; an estimated 27 states have names of Native American origin. Weiss, Sonia (1999). The Complete Idiot’s Guide to Baby Names. Mcmillan USA. ISBN 978-0-02-863367-1. OCLC 222611214. ^ a b Swanton, John R. (1953). “The Indian Tribes of North America”. Bureau of American Ethnology Bulletin. 145: 153–174. hdl:2027/mdp.39015005395804. Archived from the original on August 4, 2007. Retrieved August 2, 2007. ^ a b Swanton, John R. (1937). “Review of Read, Indian Place Names of Alabama”. American Speech. 12 (12): 212–215. doi:10.2307/452431. JSTOR 452431. ^ William A. Read (1994). “Southeastern Indian Place Names in what is now Alabama” (PDF). Indian Place Names in Alabama. Alabama Department of Archives and History. Retrieved October 3, 2011. ^ “Alabama”. The New York Times Almanac 2004. August 11, 2006. Archived from the original on October 16, 2013. Retrieved September 23, 2006. ^ Welch, Paul D. (1991). Moundville’s Economy. University of Alabama Press. ISBN 978-0-8173-0512-3. OCLC 21330955. ^ Townsend, Richard F. (2004). . Yale University Press. ISBN 978-0-300-10601-5. OCLC 56633574. ^ “Alabama Indian Tribes”. Indian Tribal Records. AccessGenealogy.com. 2006. Archived from the original on October 12, 2006. Retrieved September 23, 2006. ^ “Alabama State History”. theUS50.com. Archived from the original on August 25, 2006. Retrieved September 23, 2006. ^ a b “Alabama History Timeline”. Alabama Department of Archives and History. Retrieved July 27, 2013. ^ a b Thomason, Michael (2001). Mobile: The New History of Alabama’s First City. Tuscaloosa: University of Alabama Press. p. 61. ISBN 978-0-8173-1065-3. ^ “Alabama Historical Association Marker Program: Washington County”. Archives.state.al.us. Archived from the original on August 22, 2011. Retrieved June 1, 2011. ^ “The Pine Barrens Speculation and Yazoo Land Fraud”. About North Georgia. Retrieved July 27, 2013. ^ “Old St. Stephens”. Encyclopedia of Alabama. 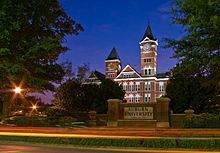 Auburn University. Retrieved June 21, 2011. ^ “Huntsville”. The Encyclopedia of Alabama. Alabama Humanities Foundation. Retrieved January 22, 2013. 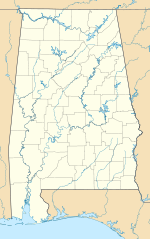 ^ “Old Cahawba, Alabama’s first state capital, 1820 to 1826”. Old Cahawba: A Cahawba Advisory Committee Project. Retrieved September 22, 2012. ^ a b LeeAnna Keith (October 13, 2011). “Alabama Fever”. Encyclopedia of Alabama. Auburn University. Retrieved September 22, 2012. ^ “Alabama Fever”. Alabama Department of Archives and History. State of Alabama. Archived from the original on January 17, 2013. Retrieved September 22, 2012. ^ a b c d Tullos, Allen (April 19, 2004). “The Black Belt”. Southern Spaces. Emory University. doi:10.18737/M70K6P. Retrieved September 23, 2006. ^ Wayne Flynt (July 9, 2008). “Alabama”. Encyclopedia of Alabama. Auburn University. Retrieved September 22, 2012. ^ “Capitals of Alabama”. Alabama Department of Archives and History. Archived from the original on July 16, 2011. Retrieved July 8, 2011. ^ “Alabama History Timeline”. Alabama Department of Archives and History. State of Alabama. Retrieved September 22, 2012. ^ “13th Amendment to the U.S. Constitution: Abolition of Slavery (1865)”. Historical Documents. HistoricalDocuments.com. 2005. Archived from the original on October 31, 2006. Retrieved September 23, 2006. ^ a b c d “Reconstruction in Alabama: A Quick Summary”. Alabama Moments in American History. Alabama Department of Archives and History. Retrieved September 22, 2012. ^ “A Blaine Amendment Update (July 00)”. Schoolreport.com. Archived from the original on July 16, 2011. Retrieved June 1, 2011. ^ a b c “Jim Crow Laws in Alabama”. Emmett Till, It All Began with a Whistle. Classroomhelp. Retrieved September 22, 2012. ^ “Segregation (Jim Crow)”. Encyclopedia of Alabama. Retrieved 2018-05-26. ^ a b “The Rosenwald School Building Fund and Associated Buildings MPS”. National Register Information System. Retrieved October 3, 2012. ^ “Great Migration | African-American history”. Encyclopedia Britannica. Retrieved 2018-05-26. ^ a b Resident Population Data. “Resident Population Data – 2010 Census”. 2010.census.gov. Archived from the original on May 19, 2011. Retrieved January 31, 2017. ^ “Birmingham | Encyclopedia of Alabama”. Encyclopedia of Alabama. Retrieved 2018-05-26. ^ “Population of the 100 Largest Urban Places: 1920”. United States Census Bureau. Archived from the original on 2008-08-14. ^ a b James Blacksher, Edward Still, Nick Quinton, Cullen Brown and Royal Dumas. Voting Rights in Alabama (1982–2006), Renew the VRA.org, July 2006, from discussion in Peyton McCrary, Jerome A. Gray, Edward Still, and Huey L. Perry, “Alabama” in Quiet Revolution in the South, pp. 38-52, Chandler Davidson and Bernard Grofman, eds. 1994. ^ Thomason, Michael. Mobile : The New History of Alabama’s First City, pages 213–217. Tuscaloosa: University of Alabama Press, 2001. ISBN 0-8173-1065-7. ^ a b “George Mason University, United States Election Project: Alabama Redistricting Summary. Retrieved March 10, 2008”. Archived from the original on October 17, 2007. Retrieved October 24, 2010. ^ “Reynolds v. Sims”. Encyclopedia of Alabama. Retrieved 2018-05-26. ^ “Baker V. Carr and Legislative Apportionments: A Problem of Standards”. The Yale Law Journal. 72 (5): 968–1040. 1963. doi:10.2307/794657. JSTOR 794657. ^ “September 2, 1963: Gov. Wallace halts integration”. ABA Journal. Mark Curriden. Retrieved 2018-05-26. ^ “Civil Rights Movement in Alabama Feature”. Encyclopedia of Alabama. Retrieved 2018-05-26. ^ a b “Civil Rights Act of 1964”. Finduslaw.com. Archived from the original on October 21, 2010. Retrieved October 24, 2010. ^ Berman, Ari (2015-10-01). “Alabama, Birthplace of the Voting Rights Act, Is Once Again Gutting Voting Rights”. The Nation. ISSN 0027-8378. Retrieved 2018-05-26. ^ “Voting Rights”. Civil Rights: Law and History. U.S. Department of Justice. January 9, 2002. Archived from the original on February 21, 2007. Retrieved September 23, 2006. ^ Martin, Jonathan; Blinder, Alan (December 12, 2017). “Alabama Senate Race Between Roy Moore and Doug Jones Ends With More Controversy”. ^ “GCT-PH1-R. Population, Housing Units, Area, and Density (areas ranked by population): 2000”. Geographic Comparison Table. U.S. Census Bureau. 2000. Retrieved September 23, 2006. ^ a b c “The Geography of Alabama”. Geography of the States. NetState.com. August 11, 2006. Archived from the original on September 17, 2006. Retrieved September 23, 2006. ^ “Elevations and Distances in the United States”. U.S. Geological Survey. April 29, 2005. Archived from the original on January 16, 2008. Retrieved November 3, 2006. ^ “NGS Data Sheet for Cheaha Mountain”. U.S. National Geodetic Survey. Retrieved June 8, 2011. 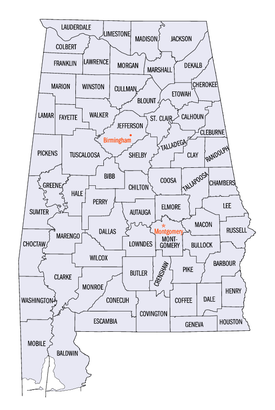 ^ “Alabama County (geographies ranked by total population): 2000”. Geographic Comparison Table. U.S. Census Bureau. 2000. Archived from the original on October 11, 2008. Retrieved May 14, 2007. ^ “National Park Guide”. Geographic Search. Washington, D.C: National Park Service – U.S. Department of the Interior. Archived from the original on September 30, 2006. Retrieved September 23, 2006. ^ “National Forests in Alabama”. USDA Forest Service. United States Department of Agriculture. Archived from the original on October 7, 2008. Retrieved October 5, 2008. ^ “Wetumpka”. Earth Impact Database. University of New Brunswick. Retrieved August 20, 2009. ^ “The Wetumpka Astrobleme” by John C. Hall, Alabama Heritage, Fall 1996, Number 42. ^ King, David T., Jr. (April 23, 2010). “Wetumpka Crater”. Encyclopedia of Alabama. Retrieved December 13, 2011. ^ “Encyclopedia of Alabama: Climate”. University of Alabama. August 17, 2007. ^ a b “Alabama Climate”. Encyclopædia Britannica. Retrieved October 24, 2010. ^ Oliver, Mike. 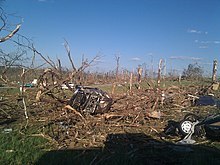 “April 27’s record tally: 62 tornadoes in Alabama”. al.com. Retrieved November 4, 2012. ^ “Record high and low temperatures for all 50 states”. Internet Accuracy Project. accuracyproject.org. Retrieved November 3, 2012. ^ “Climatography of the United States No. 20 (1971–2000) – Huntsville Intl AP, AL” (PDF). National Oceanic and Atmospheric Administration. 2004. Archived from the original on July 6, 2011. Retrieved July 6, 2011. ^ “Climatography of the United States No. 20 (1971–2000) – Birmingham Intl AP, AL” (PDF). National Oceanic and Atmospheric Administration. 2004. Archived from the original on July 6, 2011. Retrieved July 6, 2011. ^ “Climatography of the United States No. 20 (1971–2000) – Montgomery Dannelly AP, AL” (PDF). National Oceanic and Atmospheric Administration. 2004. Archived from the original on July 6, 2011. Retrieved July 6, 2011. ^ “Climatography of the United States No. 20 (1971–2000) – Mobile Rgnl AP, AL” (PDF). National Oceanic and Atmospheric Administration. 2004. Archived from the original on July 6, 2011. Retrieved July 6, 2011. ^ “Alabama Wildlife and their Conservation Status”. Outdoor Alabama. Alabama Department of Conservation and Natural Resources. Archived from the original on October 15, 2012. Retrieved October 16, 2012. ^ “About the Atlas”. Alabama Plant Atlas. Alabama Herbarium Consortium and University of West Alabama. Retrieved October 16, 2012. ^ “Mammals”. Outdoor Alabama. Alabama Department of Conservation and Natural Resources. Archived from the original on May 25, 2017. Retrieved May 22, 2017. ^ “Reptiles”. Outdoor Alabama. Alabama Department of Conservation and Natural Resources. Archived from the original on May 25, 2017. Retrieved May 22, 2017. ^ “Amphibians”. Outdoor Alabama. Alabama Department of Conservation and Natural Resources. Archived from the original on May 25, 2017. Retrieved May 22, 2017. ^ “Birds”. Outdoor Alabama. Alabama Department of Conservation and Natural Resources. Archived from the original on May 25, 2017. Retrieved May 22, 2017. ^ “Alabama Snails and Mussels”. Outdoor Alabama. Alabama Department of Conservation and Natural Resources. Archived from the original on May 25, 2017. Retrieved May 22, 2017. ^ “Crayfish”. Outdoor Alabama. Alabama Department of Conservation and Natural Resources. Archived from the original on May 25, 2017. Retrieved May 22, 2017. ^ a b “QuickFacts Alabama; UNITED STATES”. 2018 Population Estimates. United States Census Bureau, Population Division. February 16, 2019. Retrieved February 16, 2019. ^ “2010 Census Interactive Population Search”. 2010.census.gov. Retrieved December 29, 2014. ^ a b “Annual Estimates of the Population for the United States, Regions, States, and Puerto Rico: April 1, 2010 to July 1, 2012”. U.S. Census Bureau. Archived from the original (CSV) on February 5, 2009. Retrieved December 24, 2012. ^ “Population and Population Centers by State – 2000”. United States Census Bureau. Archived from the original on December 18, 2008. Retrieved December 3, 2008. ^ “American FactFinder”. Factfinder2.census.gov. October 5, 2010. Archived from the original on May 20, 2011. Retrieved June 1, 2011. ^ “Data on selected ancestry groups”. Retrieved June 1, 2011. ^ “1980 United States Census” (PDF). Archived (PDF) from the original on June 4, 2011. Retrieved June 1, 2011. ^ “Alabama – Selected Social Characteristics in the United States: 2006–2008”. Factfinder.census.gov. Retrieved October 24, 2010. ^ “Ancestry of the Population by State: 1980 – Table 3” (PDF). Retrieved February 10, 2012. ^ “Population of Alabama – Census 2010 and 2000 Interactive Map, Demographics, Statistics, Quick Facts – CensusViewer”. censusviewer.com. Retrieved July 21, 2015. ^ “American FactFinder”. Factfinder.census.gov. Retrieved February 10, 2012. ^ “AIAC Bylaws”. Alabama Indian Affairs Commission. State of Alabama. Archived from the original on September 18, 2012. Retrieved September 22, 2012. ^ “Annual Estimates of the Resident Population: April 1, 2010 to July 1, 2017”. United States Census Bureau. Retrieved February 16, 2019. ^ “Alabama (USA): State, Major Cities & Places – Population Statistics, Maps, Charts, Weather and Web Information”. citypopulation.de. ^ a b “Alabama – Languages”. city-data.com. Retrieved July 21, 2015. ^ “Alabama – Languages”. city-data.com. Retrieved July 21, 2015. ^ Barry A. Kosmin; Ariela Keysar (2009). “AMERICAN RELIGIOUS IDENTIFICATION SURVEY (ARIS) 2008” (PDF). Hartford, Connecticut, USA: Trinity College. p. 20. Archived from the original (PDF) on April 7, 2009. Retrieved May 8, 2009. ^ “Religion in America: U.S. Religious Data, Demographics and Statistics – Pew Research Center”. Pew Research Center’s Religion & Public Life Project. May 11, 2015. Retrieved July 21, 2015. ^ “Church or synagogue attendance by state”. The San Diego Union-Tribune. Archived from the original on May 13, 2012. Retrieved July 21, 2015. ^ “State membership Report”. The Association of Religion Data Archives. Retrieved November 7, 2013. ^ “Maps & Reports”. The Association of Religion Data Archives. Retrieved July 21, 2015. ^ a b “State Membership Reports”. thearda.com. 2000. Retrieved June 15, 2010. ^ Campbell, Kirsten (March 25, 2007). “Alabama rates well in biblical literacy”. Mobile Register. Advance Publications, Inc. p. A1. ^ “Confidence in State and Local Institutions Survey” (PDF). Capital Survey Research Center. Archived from the original (PDF) on June 14, 2007. Retrieved June 2, 2007. ^ White, David (April 1, 2007). “Poll says we feel good about state Trust in government, unlike some institutions, hasn’t fallen”. Birmingham News. p. 13A. ^ a b Zietz, Robert (1994). The Gates of Heaven : Congregation Sha’arai Shomayim, the first 150 years, Mobile, Alabama, 1844-1994. Mobile, Alabama: Congregation Sha’arai Shomayim. pp. 1–7. 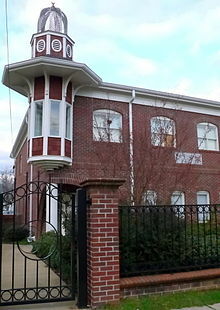 ^ “Synagogues in Alabama”. Kosher Delight. Retrieved September 8, 2012. ^ Kay Campbell (February 29, 2012). “Survey: U.S. Muslims grow by 30 percent since 2000”. The Huntsville Times. Retrieved September 8, 2012. ^ “Hindu Temples in the South East: catering to the needs of NRI and Indians in US”. GaramChai. Retrieved September 22, 2012. ^ “History of Hindu Mandir & Cultural Center”. Hindu Mandir & Cultural Center. Retrieved September 22, 2012. ^ “Dharma Centers and Organizations in Alabama”. Manjushri Buddhist Community. AcuMaestro. Retrieved September 22, 2012. ^ Frye Gaillard (December 2007). “After the Storms: Tradition and Change in Bayou La Batre”. Journal of American History. Organization of American Historians. Archived from the original on December 1, 2012. Retrieved September 22, 2012. ^ Roy Hoffman (October 22, 2011). “For Vietnamese Buddhists In South Alabama, A Goddess Of Mercy Is A Powerful Figure”. Press-Register. Retrieved September 22, 2012. ^ Debbie M. Lord (August 29, 2009). “A Welcome Gateway to the Far East”. Press-Register. Retrieved September 22, 2012. ^ Katherine Sayre (May 17, 2012). “Buddhist Monk Killed Temple Leader During Argument Over Food, Prosecutor Says”. Press-Register. Retrieved September 22, 2012. ^ “Bahais of the Shoals”. shoalsbahais.com. Archived from the original on May 11, 2015. Retrieved July 21, 2015. ^ “County Level Estimates of Obesity – State Maps”. Centers for Disease Control and Prevention. 2008. Archived from the original on March 31, 2014. ^ “Highest Rates of Leisure-Time Physical Inactivity in Appalachia and South”. Centers for Disease Control and Prevention. 2008. ^ “Alabama – Percentage of Adults(aged 18 years or older) with Diagnosed Diabetes, 1994 – 2010”. Centers for Disease Control and Prevention. 2010. Archived from the original on October 18, 2011. ^ “CDC national chart on diabetes”. Apps.nccd.cdc.gov. Archived from the original on October 15, 2011. Retrieved June 1, 2011. ^ Ijaz, Ahmad; Addy, Samuel N. (July 6, 2009). “Food Production in Alabama”. The Encyclopedia of Alabama. Auburn University. Retrieved September 22, 2012. ^ “United States Census Bureau”. State and County Quick Facts. Archived from the original on February 26, 2012. Retrieved February 25, 2012. ^ “Local Area Unemployment Statistics – Alabama”. Bureau of Labor Statistics. Retrieved June 15, 2013. ^ “Bureau of Labor Statistics Data”. United States Department of Labor. Retrieved July 6, 2015. ^ Kasperkevic, Jana (February 26, 2016). “Alabama passes law banning cities and towns from increasing minimum wage”. The Guardian. ^ Ballesteros, Carlos (December 10, 2017). “Alabama Has the Worst Poverty in the Developed World, U.N. Official Says”. Newsweek. Retrieved September 13, 2018. ^ Aneesa McMillan. “Top of the List: Alabama’s largest employers” (April 22, 2011). Birmingham Business Journal. ^ “Alabama’s Largest Employers”. Birmingham Business Journal. American Registry. April 2011. Retrieved September 19, 2012. ^ “Alabama and CBER: 75 Years of Change” (PDF). Alabama Business. Center for Business and Economic Research, Culverhouse College of Commerce, The University of Alabama. 2005. Archived (PDF) from the original on September 27, 2006. Retrieved September 23, 2006. ^ “State Highlights for 2004–2005” (PDF). Alabama Cooperative Extension System. USDA, NASS, Alabama Statistical Office. 2005. Archived (PDF) from the original on September 21, 2006. Retrieved September 23, 2006. ^ “Vehicle Technologies Program: Fact #539: October 6, 2008, Light Vehicle Production by State”. .eere.energy.gov. October 6, 2008. Archived from the original on October 6, 2008. Retrieved October 24, 2010. ^ McCreless, Patrick (October 31, 2012). “Automakers account for about a third of the state’s industrial expansion”. The Anniston Star. Archived from the original on October 22, 2013. Retrieved June 15, 2013. ^ Kent, Dawn (April 2, 2013). “U.S. auto sales see gains in March, as Alabama-made models rise 4 percent”. AL.com. Retrieved June 15, 2013. ^ “ThyssenKrupp’s Alabama incentive package tops $811 million”. Press-Register. May 11, 2007. Archived from the original on July 26, 2011. Retrieved July 22, 2011. ^ “New owners of ThyssenKrupp stainless steel division plan visit in June”. Press-Register. May 31, 2012. Retrieved June 15, 2013. ^ “Report: ThyssenKrupp gets final bids for Steel Americas plants”. AL.com. March 1, 2013. Retrieved June 15, 2013. ^ “Alabama: Ende 2014 bei voller Kapazität – stahl-online.de”. stahl-online.de. Retrieved July 21, 2015. ^ “Hunt Refining Company.” Linkedin. ^ “Company Overview.” JVC America, Inc.
^ Melissa Nelson-Gabriel (July 2, 2012). “Airbus to Build 1st US Assembly Plant in Alabama”. Associated Press. Retrieved July 2, 2012. ^ “Airbus confirms its first US factory to build A320 jet”. BBC News. July 2, 2012. Retrieved July 2, 2012. ^ Nicola Clark. “EADS to Build United States Assembly Line for Airbus A320”. The New York Times. Retrieved July 2, 2012. ^ “Airbus Appoints Program Manager for its Mobile Assembly Line”. Airbus. Retrieved February 7, 2013. ^ Fahrenthold, David A. (May 2, 2010). “Obama to survey environmental damage in gulf”. Washington, DC: Washington Pose. p. A6. ^ “Planning Your Alabama Visit”. alabama.travel.com. Sweet Home Alabama. Retrieved 16 September 2016. ^ “Verified Trauma Centers”. American College of Surgeons, Verified Trauma Centers. December 30, 2010. Retrieved January 9, 2011. ^ “College Research Data”. University of Texas. Archived from the original on April 4, 2012. Retrieved April 18, 2012. ^ “UAB – Human Resources – Home”. uab.edu. Retrieved July 21, 2015. ^ Campbell Robertson, Alabama Simmers Before Vote on Its Constitution’s Racist Language, New York Times, October 10, 2012. ^ Roig-Franzia, Manuel (November 28, 2004). “Alabama Vote Opens Old Racial Wounds”. The Washington Post. Retrieved September 22, 2006. ^ “Constitution of Alabama – 1901”. The Alabama Legislative Information System. Archived from the original on September 23, 2006. Retrieved September 22, 2006. ^ “Alabama Citizens for Constitutional Reform”. Constitutionalreform.org. Archived from the original on September 15, 2010. Retrieved October 24, 2010. ^ Lee, McDowell (2009). “Alabama’s Legislative Process”. State of Alabama. Archived from the original on January 2, 2011. ^ SARA RIMER, “Questions of Death Row Justice For Poor People in Alabama”. New York Times, 1 March 2000. Accessed 11 March 2017. ^ a b Rebecca Buckwalter-Poza (2014-07-27). “With Judges Overriding Death Penalty Cases, Alabama Is An Outlier”. NPR.org. Retrieved 2016-07-21. ^ “Supreme Court Reverses Another Alabama Death Penalty Case”. EJI. 2016-06-21. Retrieved 2016-08-03. ^ “Alabama Gov. Kay Ivey signs bill: Judges can no longer override juries in death penalty cases”. AL.com. 12 April 2017. Retrieved 13 December 2017. ^ “Comparison of State and Local Retail Sales Taxes”. Archived from the original on May 20, 2007. Retrieved 2007-05-26. CS1 maint: BOT: original-url status unknown (link). taxadmin.org, July 2004, Retrieved December 18, 2013. ^ a b c d “Reducing Alabama’s Income Tax on Working-Poor Families: Two Options”. Cbpp.org. April 14, 1999. Retrieved October 24, 2010. ^ “Alabama State Local Tax Burden Compared to U.S. Average (1970–2007)” (PDF). Tax Foundation. Archived from the original (PDF) on June 5, 2007. Retrieved May 30, 2007. ^ Rawls, Phillip (June 1, 2007). “Alabama offers an apology for slavery”. The Virginian Pilot. Landmark Communications. ^ White, David (November 2, 2010). “GOP takes control of Alabama Legislature after 136 years”. The Birmingham News. Retrieved July 9, 2018. ^ “Elections Data Downloads”. Alabama Secretary of State. Retrieved December 12, 2017. ^ “Sue Bell Cobb considering running for governor”. The Birmingham News. May 2, 2009. Retrieved August 7, 2009. ^ “Commissioners”. Psc.state.al.us. Archived from the original on July 18, 2009. Retrieved August 7, 2009. ^ Special (November 5, 2008). “Lucy Baxley wins Alabama Public Service Commission presidency, but recount possible”. Birmingham News via al.com. Archived from the original on August 2, 2009. Retrieved August 7, 2009. ^ Jeff Amy. “Public Service Commission: Twinkle Cavanaugh, Terry Dunn join GOP sweep”. al.com. Archived from the original on March 6, 2012. Retrieved June 1, 2011. ^ “2006 Gubernatorial Democratic Primary Election Results – Alabama”. Uselectionatlas.org. Retrieved August 7, 2009. ^ “2006 Gubernatorial Republican Primary Election Results – Alabama”. Uselectionatlas.org. February 15, 2007. Retrieved August 7, 2009. ^ a b “Alabama Sheriffs 2015-2019”. www.alabamasheriffs.com. ^ “Alabama Education Quick Facts 2012-13” (PDF). Retrieved April 29, 2014. ^ “Educational Attainment : 2000 : Census 2000 Brief” (PDF). Census.gov. Retrieved December 29, 2016. ^ a b Farrell, Colin (February 2016). “Corporal punishment in US schools”. . Retrieved April 4, 2016. 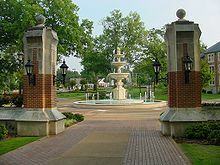 ^ “Directory of Alabama Colleges and Universities”. Alabama Commission on Higher Education. Archived from the original on October 11, 2013. Retrieved July 28, 2013. ^ “The University of Alabama”. www.ua.edu. ^ “History in the making”. University of North Alabama. Archived from the original on August 21, 2011. Retrieved July 22, 2011. ^ “The Mission Statement of Spring Hill College: History”. Spring Hill College. Archived from the original on August 21, 2011. Retrieved July 22, 2011. ^ “Members”. Association for Biblical Higher Education. Archived from the original on August 21, 2011. Retrieved June 24, 2011. ^ “Membership Directory” (PDF). Council on Operational Education. November 2010. Archived from the original (PDF) on August 5, 2011. Retrieved August 5, 2011. ^ “ACICS Website Directory” (PDF). Accrediting Council for Independent Colleges and Schools. July 20, 2009. Archived from the original (PDF) on August 5, 2011. Retrieved August 5, 2011. ^ “Top Public Schools”. U.S. News & World Report. Archived from the original on September 18, 2011. Retrieved September 17, 2011. ^ “Alabama”. Encyclopædia Britannica. Retrieved March 24, 2017. ^ “APT – WGIQ Channel 43 Television”. stationindex.com. Retrieved 2017-05-12. ^ “Bryant–Denny Stadium”. RollTide.com. University of Alabama. Retrieved July 28, 2013. ^ “Stadium List: 100 000+ Stadiums”. World Stadiums. Retrieved February 10, 2012. ^ “Jordan-Hare Stadium”. Auburn Athletics. Auburn University. Retrieved July 28, 2013. ^ “Legion Field”. UABSports.com. University of Alabama at Birmingham. Archived from the original on May 25, 2013. Retrieved July 28, 2013. ^ “Welcome to Ladd Peebles Stadium”. Laddpeeblesstadium.com. January 23, 2012. Retrieved February 10, 2012. ^ “Super 6 leaving Birmingham for Bryant-Denny, Jordan-Hare stadiums | al.com”. Blog.al.com. Retrieved February 10, 2012. ^ “Table 1086. Top U.S. Ports by Tons of Traffic: 2009” (PDF). U.S. Army Corps of Engineers. Archived from the original (PDF) on October 19, 2012. Retrieved July 22, 2013. ^ “U.S. Waterborne Container Traffic by Port/Waterway in 2011 (Loaded and Empty TEUS)”. U.S. Army Corps of Engineers. Archived from the original on November 3, 2013. Retrieved July 22, 2013. “Alabama – History and Culture.” Adventure Tourism – Experiential Travel Guides. Accessed: March 31, 2017.